Heh,heh! That's quite the look! Me too! Paws up for claws! I think I'll stay out of your way! 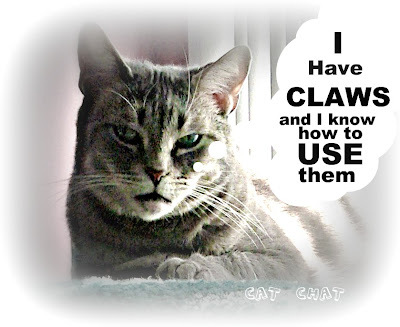 Use those claws wisely. I've felt a bit like that this week! Ouch! We think the sofa's gonna get it! Attention all...you have been so warned! Oh Cody, nice try, but it's easy to see that you don't have a mean bone in your body ;-)! Yep, that expression on your face says you mean business with those claws, Cody! ha ha - I think you got the message across to your oomans pal. He's such a tough guy sometimes! Tee! Hee! And doesyous sharpen your daggers on the sofa like me does? @Fuzzy Tales I sure do! We've been thinking along the same lines. Did you scratch your Mom? I've been doing a job on TW. No claws in your contract, Cody my boy? That's Oscar or Jennifer, right? If I was your mom, I'd be on my best behavior.... Should I be worried for her? Ok, we will stay away from you Cody. That is a mean look you have there. Hope things start to go better for you Cody. Take care. Oh dear, this could get dangerous! Go for it! Show them pesky critters who is boss around here! Where does one get a poster like that? It's FANTASTIC! Uh oh, who's upset you Cody? We are afraid - we are very afraid! @Meg thanks so much and WELCOME! I will check yours out as well! We love having new readers! @Hilary nope it isn't Mom! @Cathy Keisha I seriously doubt it is for the same reason! MOL! Yikes! We get the message, Cody. Guess that felines too can have a headache and yes, the combination with claws works well then! FaRADaY: BWAAAA-HA-HAAAAA! Canz I steal that line??? PAWESOME! Hello! You know that I do not know the English very well! I have read these comments.I do not what about talking...I hope everything is OK! Aha, well this posting was um, up to scratch! haha, Cody...don't worry. NO ONE is gonna mess with you! @Katie and Glogirly, like Mother like CAT! MOL! @Mariette love back to you! Thank you for your clarifying post about GFC. I have mentioned/shared it liberally! Wow! What a great picture of Cody! He really does look dangerous, but we all know he's a real sweetheart. So cuddly, so furry, so loving and loyal but when I see Charlie Coal fighting in the street, rolling around like a street fighter from 'Gangs of New York' movie, I think that I would hate to be on the ends of those claws!